In 1985, more than a million visitors from the UK, mainland Europe and as far as America and Africa flocked to witness a remarkable and historical festival in London – the Cultural Festival of India. Over eighteen acres of lush parkland surrounding Alexandra Palace were transformed into a cultural wonderland bringing the sights, sounds, tastes and experience of India to north London. For over a month – from 15 July to 18 August 1985 – traditional art, architecture, dance and musical performances as well as enlightening exhibitions helped visitors learn about the rich cultural heritage of India. A unique Suvarna Mahotsav was also held on 20 July 1985 as part of this momentous event. To commemorate the festival’s 30th anniversary, a special programme was organised at BAPS Shri Swaminarayan Mandir in London on the weekend of 8-9 August 2015 in the presence of Sadguru Pujya Mahant Swami (Keshavjivan Swami), Sadguru Pujya Ishwarcharan Swami, Pujya Atmaswarup Swami and visiting sadhus from India. Golden memories of those present in 1985 were rekindled, and those who were not present became part of the unique and historic occasion through a spectacular fusion of vibrant dances, enlightening sketches, devotional singing and emotive video presentations that brought the event to life. The first part of the evening focussed on the memories of volunteers, devotees and sadhus through speeches, interviews and video highlights – sharing their experiences about the planning, execution and management of the festival. They revealed eye-opening accounts of the tremendous challenges they had faced and how they overcame them with unity, determination, hard work and, above all, the blessings and guidance of Swamishri. Thakorji and Swamishri were then joyously welcomed into the assembly hall with a marching band and waving of flags from the audience. A devotional welcome song was performed by youths thereafter, charging the prayer hall with divinity. 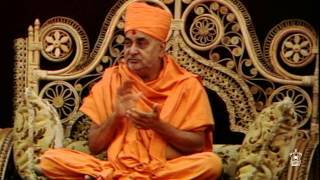 Ishwarcharan Swami spoke of the divine virtues of Swamishri by touching on some inspiring examples of his faith and conviction in God. He also offered practical guidance on how one can understand Swamishri’s greatness. 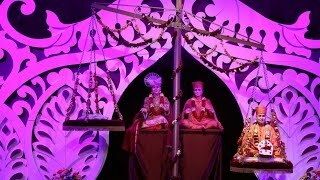 Mahant Swami spoke of the key messages of the evening’s festivities, encouraging all present to lead pure and spiritually elevated lives, and to work together with unity in order to please Swamishri and thus keep these treasured memories alive. The evening was concluded with an emotional prayer incorporating a special video recording of Swamishri from Sarangpur. All haribhaktas then had the opportunity to offer their personal devotion in the form of saakar (sugar crystals) to the murtis of Thakorji and Pramukh Swami Maharaj.